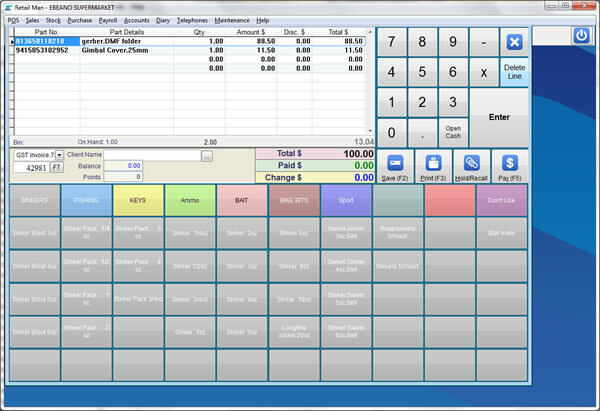 Retail Man POS is used internationally to convert a computer into a powerful Point of Sale and Inventory system with Accounting features included. Used internationally, with resellers in more than 50 countries. Support is included for most leading brands of POS hardware :- docket printer, bar code scanner, cash drawer, pole display, touch screen, scales. Retail Man features a simple user interface with powerful security at several levels. Ideal for most shops and retail outlets. Manage the inventory of stock to maximise the return. Quick Menu Buttons for commonly sold items. Retail Man is the easy to use POS solution purchased with no annual licence fees. Options for rental are available for more flexibility. Available as a download with a free 90 day full function evaluation. Retail Man POS includes reports with stock control, inventory and accounting functions like invoicing and debtors control, purchasing and creditors control, double entry accounting. Pricing for Retail, Wholesale and other levels. Support for POS stations and workstations running Windows 10, 8, 7, Vista and Windows Server. Facilities for export or import data, for interfaces with other software. Sending of invoices, statements and quotes to customers by E-Mail is included. Retail Man screens and reports can be can be customised to meet local requirements. Currency, sales taxes (one or two) and setup can be localised to suit most countries. Menus can be installed in Arabic, Chinese, Dutch, French, Portuguese, Spanish which allow operation in many countries in Africa, Caribbean, Europe, Middle East, South America. Support is included for integration with web stores including OpenCart. Upgrade to add POS stations, work stations or another store to expand with your business. First user in a store costs USD349, each extra user in a store cost USD130. Credit and debit card processing with ChargeItPro for customers in USA, Canada, PaymentSense in UK, Ireland, PC EFTPOS in Australia. System requirements: Pentium 1000, 400MB disk space, 600x800 VGA, Windows Vista, 7, 8, 10, Windows Server.